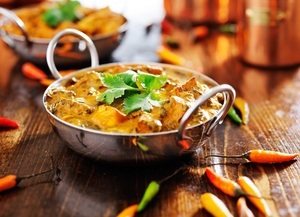 THIS EXCITING CLASS IS PERFECT FOR ANY CURRY CONNOISSEUR AND / OR BEER ENTHUSIAST. Under the guidance of our Chef you will use fresh ingredients to create authentic Indian dishes that will set your taste buds alive. This evening is suitable for all levels of experience as our team will be on hand to make everything easy. You will be taken step by step through cooking a Chicken Dopiaza, a Lamb Rogan Josh, Vegetable Pakora and Raita. Our Chef will have some Naan Bread dough ready for you and teach you how to cook it yourself. Once all the cooking is over you will get the chance to be waited on and enjoy eating your meal with two bottled Beers included in the price.